Golden Apples: Phooey to Fear—We have nothing to fear but fear itself. Phooey to Fear—We have nothing to fear but fear itself. Where is FDR's good advice when we need it? Fear mongering is the order of business these days. Everywhere there is something to fear--all our prospective leader's are campaigning about fear. One local NY new station has regular features on the news—UNSAFE TO EAT, UNSAFE TO BREATH, UNSAFE TO DRINK—and presents lurid stories about every potential risk we face. Is the water safe to drink? Sure –I don't remember seeing any stories about people falling down dead! Are there things we could do better? Absolutely! But on average, the quality of water found in the average US toilet bowl is 1000 times cleaner than the local drinking water in the world--Should our water be cleaner? Yes, but it is full of unhealthy contaminants? By a world measure, not by a long shot. Fact is, while people can and do get sick from dirty water, people also have robust immune systems to deal with most risks. Is some drinking water contaminated with prescription drugs? YUP. The quantities? About equal to 1 sugar cube dissolved in an Olympic sized swimming pool full of water. Should we be aware, and take action to reduce this? Yup. But should we be afraid to drink tap water? Hardly! Should you think about that, and not put it onto the dining room table, or kitchen counter, or other places there might be food? Yup.. But the 'contiminates' found? Common ground mold. --the same kind you might encounter if you sat on the grass, or raked leaves, or gardened. Ever picnic out doors? Sit down on the grass, (touch the grass) and then eat? Oooh—look out—there could be mold, or bacteria. The same sort of mold and bacteria humans have been living with for thousands and thousands of years. (and surviving!) We humans have been living in this world, exposed to all sorts of bacteria for a long time... and we have survived. Are there real things to fear in this world of ours? Yes. but lately its seems we are all too afraid of our fears--we are fearful of fear itself! There are fearful knitters too.. Recently I saw a thread on a BB (which BB? Take your pick!) --someone was looking for a pattern for place mats. Huh? Place mats? What are place mats but over sized swatches? Pick a yarn, pick a stitch, find the gauge, cast on and go. Needles: 1 set of each: size 7, size 8 and size 9 (that's 4.5mm, 5mm, and 5.25) needles. Make a 10 stitch by 15 row swatch (optional)in stocking knit. Use the swatch to guesstimate the correct number of stitches to cast on. Find a stitch pattern you like the look of, or one you want to learn, or suits your fancy. Or go with 33 (3X11) + 5 (half pattern for repeat, +6 for selvage (3, not 2 selvages stitches) for a total of 44 stitches, for a smaller cloth. Cast on required number of stitches. Work a row or two of selvage edge. Work in pattern till the knitting is almost square. If you've never done a I-cord cast on or an I-cord selvage, or an I-cord bind off, consider using all three for the selvage stitches on one face cloth. --A wash or face cloth is a good place to learn a technique. If you've never done a simple double knit selvage, or a tubular cast on or a kitcherned bind off, consider using these techniques on a face cloth. If you've never knit a mitered square, --a face cloth is a fine way to try this out. Want to knit a sweater that has mitered cables as a edging? Learn the technique with some cotton and make a face cloth. If the results aren't perfect, well, does it matter much? If you are a perfectionist, you can frog and redo, or more realistictly, you can just make another wash cloth, and try again until you do get it right! Want to Knit a set of place mats? Or a throw pillow? You don't need a pattern. You can just knit --REALLY, you can! There might be real things to be afraid of in the world, but knitting shouldn't be one. 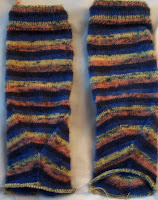 --Meanwhile, I am cruising along on my striped socks, --these are almost identical to previous pair. Finally, some photos (taken by DD) of her mostly completed bathroom (it still needs new flooring (not shown) and the steam pipe riser (all too familiar to most Nyers') can't be painted till the end of the heating season. 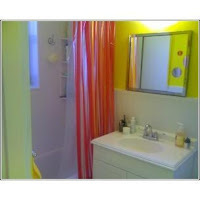 Like most NY apartment (be they rentals or co-ops) the bathroom is slightly larger than a postage stamp. --And it's bigger than my bathroom.. (and has a window, not just a ventilation fan!) but it certainly looks better bright, white, and resurfaced! 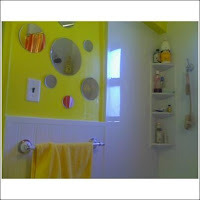 Great post, and I love the bathroom! Loved your post. I'm a fear monger so it's time to stop. 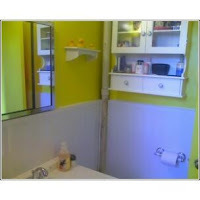 Your DDs bathroom is really peppy looking and sparky. Love it!